Dec. 1-4, 2011 Grove Park Inn & Spa Asheville, N.C.
We believe that Family Medicine is essential to the well-being of the health of North Carolina, and that Family Medicine is well-suited to improve the health of the residents of our state. We believe in a healthcare system that is primary care driven. We believe there is an inherent value in a primary care medical home - providing	quality, access and affordability. We believe in a healthcare system that is fair, equitable, and accessible. We believe in the elimination of health disparities and barriers to access to healthcare for North Carolina. We believe in a comprehensive approach to patient care and value the health and well-being of patients, families, and communities. We value collaborative communication with all parties concerned with healthcare delivery, and advocate for a positive practice environment to nourish the specialty of Family Medicine. We value the professional and personal well-being of our members. Quality, evidence-based, timely education. Professional excellence and integrity. Fiscal responsibility, organization integrity and viability. Creativity and flexibility. Member-driven involvement in leadership and decision making. These two bills will make a significant improvement to the practice environment in North Carolina, while at the same time preserving key patient protection provisions. Without your support – your calls and e-mails to members of the Legislature – this bill would have never been approved, and the Governor’s veto would have definitely not been overridden. I would like to personally thank you for your efforts. This once again shows that when the healthcare community comes together, we can make a difference in our state’s legislative process. This legislative session we were also able to preserve physician rates for Medicaid, preserve our strong physician-led Community Care of North Carolina network, and stand firm that key healthcare (such as immunizations) should be provided in the medical home. I invite you to read more about these significant accomplishments in an article by Advocacy Chair Dr. Chuck Rich on page 6 of this magazine. But as our Government Affairs Consultant Peyton Maynard always says, there are never permanent wins or losses in the General Assembly, only battles, because the next issue is always staring at us around the corner. Given that, I ask for your continued help. Now more than ever, we need to fill the coffers of our Political Action Committee (FAMPAC). I ask that you take a moment and contribute just $100 to our PAC, so that we can continue to stand together for Family Medicine. This year’s session showed us what is possible, but without ongoing financial support for contributions to candidates who have supported our issues, we may not be as lucky when the next battle comes along. •	Places a $500,000 cap on non-economic damages adjusted to inflation with some exceptions for disfigurement, loss of use of part of the body, permanent injury or death when gross negligence occurs. •	Establishes new provisions for appeal bonds. •	Provides for special rules for claims arising from emergency medical conditions in hospitals requiring that negligence is proven by “clear and convincing” evidence. This provision should be helpful in making it easier to find specialty physicians to take unassigned call in the Emergency Room. •	Moves to bifurcation of trials with Phase 1 looking at negligence and Phase 2 looking at how severe the injury was and what damages should be awarded. •	Strengthens expert review provisions. •	Places time limits on malpractice claims for minors under 10 years of age. These provisions had allowed for filing of a suit up until a minor turned 18, even if the claimed damages occurred at birth. Now, the age limit is 10 unless it is covered by another statute of limitation. A separate tort reform bill (House Bill 542), requires that information on medical claims be based on expenses actually paid. In the past, a jury was only allowed to hear about billed charges, even though the amount actually paid may have been significantly less. Studies have shown Studies have shown that encounter length that encounter length is directly responsible is directly responsible for forquality qualityof of outcomes. outcomes. The Direct Pay Health The Direct Pay Health model is simple: model is simple: remove unnecessary remove unnecessary overhead thatdoes does overhead that not contributeto to not contribute patient care. patient care. Anyone who wants Anyone who wants good quality, low cost good quality, low cost Primary Care will be Primary Care will be rightatathome homeinina a right DirectPay PayHeath Health Direct oﬃce. oﬃce. When patients visit When patients visit your Direct Pay Health your Direct Pay Health practice, they’ll know practice, they’ll know total charge thethe total charge andand how much to pay how much to pay at at checkout. checkout. Is Available Available Now. Now. Welcome to the summer 2011 Advocacy Council Report. As of this writing, the Republican-led legislature has completed its primary work for this session and the approved bills have gone to the Governor. While many of those bills were signed, a record number were vetoed and the legislature returned to Raleigh in mid-July to consider an override of those vetoes, among other actions. Briefly, I will review the pertinent legislation which passed and highlight NCAFP’s efforts during this session. The primary focus of this legislative session was the state budget and its impact on our members. The legislature ultimately approved a budget that leaves physician Medicaid provide rates - and the core of the Medicaid program - intact, even after the usual yearly discussions of possibly bringing in an out-of-state Medicaid HMO. Community Care of North Carolina was called upon to produce additional cost savings for the coming year as part of the budget deal. Under the leadership of NCAFP Past President Dr. Allen Dobson, it is anticipated that those savings will be obtained. Since Medicaid is an important revenue source for many of our offices, preservation of physician payment rates was a key area of emphasis for our legislative team, especially as initial budget discussions included talk of potential provider cuts of 10% or more. Thanks to the combined lobbying efforts of the NCAFP, the NC Pediatric Society, the North Carolina Medical Society, and the NC Hospital Association, physician rates were left intact, although hospitals did agree to absorb a small reimbursement cut. The next major area of focus during this session was the passage of a significant medical malpractice bill - Senate Bill 33. As passed by the legislature, this bill contained several major changes favorable to physicians, including expert review of all cases prior to proceeding to trial, caps on non-economic damages at $500,000, clear protections for providers in emergency situations in hospitals, and changes in the statutes of limitation for birth injuries (down to age 10). Led by efforts from the NC Medical Society, the NCAFP assisted in the advocacy work to achieve passage of this bill, although the legislation was subsequently vetoed by Governor Perdue. Disagreeing with the governor’s reasons to veto the bill, the Academy worked closely with the Medical Society to persuade the legislature to override the governor’s veto. After much lobbying in July, both the Senate and the House voted to override the Governor’s veto, making the bill law. The legislature also considered various scope-of-practice bills which would have impacted physician practices across the state. Foremost of these was the proposal to expand the immunizing authority of pharmacists. Cary’s Dr. Conrad Flick Discusses CCNC at Capitol Hill Briefing on State of Medicaid The Partnership for Medicaid, a non-partisan coalition of doctors, hospitals, health centers, health plans, and health care professionals, held a lunch briefing in Washington, D.C., in mid-June to examine the current state of Medicaid. NCAFP Past President and current AAFP Board Member Dr. Conrad Flick of Cary, NC, was one of four main speakers at the event. Dr. Flick shared his ‘on-the-ground’ perspectives on Medicaid and talked about the impact that Community Care of North Carolina (CCNC) has had on his practice. “We cut costs primarily by providing greater quality and improving efficiency,” he said. “By that, I mean we provide the same services that we always have. We don’t decrease the access, and we don’t decrease the number of needed services. We just find the efficiencies in the services themselves.” Flick practices in Raleigh and pointed to the CCNC program as an example of how Medicaid could be reformed. CCNC has improved quality and saved billions in health care costs by relying on patientcentered medical homes and care coordination to deliver care to most of the state’s Medicaid population. Support Your State Political Action Committee! The AAFP has formed a new Primary Care Valuation Task Force to review the methods for valuing health care services and make recommendations about more accurately valuing and paying for primary care physician services. An inaugural meeting is set for August 22nd in Washington, D.C. The task force will begin a six- to nine-month process to identify ways to appropriately appraise evaluation and management services (E&M) provided to patients. The task force consists of 22 thought leaders with extensive health care system and policy expertise. Chairing the group is North Carolina’s Dr. Lori Heim, AAFP Board Chair. “Increasingly, research suggests that the complexity of primary care physicians’ evaluation and management services are different and more intense than the E&M services provided by other specialties,” said Dr. Heim. “As a matter of fact, CMS recognized in their 2012 proposed Medicare Physician Fee Schedule the need to review primary care codes and asked the RUC to prioritize the review of these E&M codes.” The typical patient encounter varies across specialties and likely underestimates the intensity of the primary care physician’s work. The new task force will focus its attention on alternative payment methods that could work within the current fee-for-service model. The task force will present its findings to the AAFP Board during the first quarter of 2012. The AAFP Board will then present the recommendations directly to the Centers for Medicare and Medicaid Services for its consideration in assessing the appropriate work relative value units that measure the worth of a service and determine Medicare fee-for-service payment to primary care physicians. Formation of the task force comes on the heels of another AAFP announcement about primary care physician payment. Last month, the AAFP strongly requested that the RUC make specific changes in its structure, process and procedures so that primary care services are more fairly assessed and valued. activity entails and physicians are free to begin their practice change immediately. Participating physicians are required to complete a ‘Commitment to Change’ statement and must report back to the Chapter/ provider within 120 days of commencing their activity. And because t2p is not a self-reporting credit category, all practice change reporting must be submitted to the Chapter or CME provider. The AAFP is still evaluating the overall program as of this writing and has yet to officially approve t2p as a permanent credit category. It is anticipated that if the pilot is successful, t2p credits would be available for all Prescribed CME credits. SILENT AUCTION Office Procedures Workshop is Sept. 24th! Minor in-office procedures like skin biopsies and joint injections can be excellent -- and profitable -- value-added services for family physicians and primary care practices. Instead of being referred out of practice, patients appreciate when their personal physician can provide these services. The procedures become a win-win situation for everyone! To get more physicians up to speed, the Academy is offering its popular ‘Office Procedures Workshop’ in a convenient format. The seminar will take place on Saturday, September 24, 2011, at the Sheraton Greensboro Hotel at Four Seasons/Koury Convention Center. The workshop consists of two main segments. First, Mastering Joint Injections for Physicians, FNPs & PAs, will describe the indications and contraindications for joint and soft-tissue injections and aspirations, discuss the critically reviewed evidence-based literature, and identify safe and effective techniques for the 16 most common procedures. Participants will practice injection/aspiration techniques in various locations, including the shoulder, elbow, wrist, hand, hip, knee, and foot. A light lunch and question-and-answer session will follow. The final segment, Mastering Skin Biopsy Techniques for Physicians, FNPs & PAs, will review common techniques used to perform skin biopsies. Indications and contraindications for performing biopsies will also be discussed, as will the preferred approaches to specific lesions. Participants will perform the different types of techniques including punch, shave, currette, incisional, and excisional biopsies using the fusiform excision technique. Registration is only $125 and includes a continental breakfast and a light lunch. Visit http://www.ncafp.com/procedures for complete information and registration on the workshop. Items Needed for the Silent Auction Christmas in August? No, not really, but it isn’t too soon to start thinking about trinkets, treasures and great gift ideas for the NCAFP Foundation’s Silent Auction! This year’s event will once again be held immediately prior to the Presidential Gala, dinner and dance on Saturday evening, December 3rd, 2011, at The Grove Park Inn. The entire family will enjoy this Saturday night complete with terrific items for bidding, along with live entertainment and fun. This is a call to all members to consider making a contribution to this important annual fund raiser. Make it easy on yourself and send a monetary donation. We are happy to do the shopping for you. Or consider obtaining donations from your local community such as restaurant gift certificates, children’s items, weekend getaways, sports memorabilia, or tickets to events. Donations of wine, artwork, jewelry, gift baskets and your handiwork are also encouraged. Donations to the Silent Auction are eligible as tax-deductible charitable contributions. An official Donation Form for tax reporting purposes will be sent to each donor. Please contact Tracie Hazelett, NCAFP Foundation Development Coordinator, with any questions you may have or to contribute to the event at thazelett@ncafp.com or 919-833-2110 / 800-872-9482 (NC Only). We appreciate your contributions & participation and we look forward to seeing you in December! Moses Cone Residency Program Director Dr. William Hensel shared insights. Based at Cone Health’s flagship 536-bed hospital, Moses H. Cone Memorial in Greensboro, the program offers residents a robust clinical training ground that serves a medically diverse patient base. The residency’s main practice center is a 13,000 square-foot facility designed specifically for teaching ambulatory care and equipped with all of the expected conveniences: an on-site lab, 16 exam rooms, conference suites and a procedures room. It serves a patient population comprised of approximately 35% Medicaid, 25% Medicare, 31% Managed Care, and 9% self-pay. Cone’s core mission is to train resident family physicians to serve their communities in a context that promotes the traditional principles of Family Medicine. The program relies on its 42-years of training experience to build each physician’s clinical acumen, yet also embraces modern team-oriented, evidence-based approaches. This helps physicians not only to train well, but to live well while in training. “We work hard to recruit team-oriented physicians. We also work hard to have balance between personal and professional life, yet maintain high standards,” noted Hensel. “This is appealing to a lot of folks.” Balancing the heavy clinical demands with its residents’ personal needs is never easy. The program holds a number of social activities each year with residents and faculty that complement its team-building efforts in the clinic and help residents to establish personal connections. “The future is teamwork - professional relationships that work together for the good of the community. If we can form those relationships and model that teamwork now, we can help our graduates thrive,” noted Dr. Hensel. Teamwork is only part of the Cone’s training recipe. The program has also embraced health information technology and patient-centered, evidence-based care to prepare its residents for practice life. Residents utilize a fully-implemented electronic health record and also have access to stipends for hand-held computing devices. And with PCMH Level III recognition, new patient-centered approaches are being integrated into all facets of its teaching spectrum. Moses Cone’s teamwork, technology and patient-centered curriculum help produce family physicians that are prepared to practice in any type of setting. Dr. Hensel believes Cone’s current training program and its practice management curriculum help its graduates transition well, in either employed or independent practice roles. “Much of our practice management curriculum is geared towards not the long distant future, but the immediate future for our residents,” commented Hensel. “We want our residents to be paid and valued for all they can do, but we also want them to be valuable to their organizations.” Dr. Hensel did note that challenges exist in preparing residents for clinical efficiency while health care moves toward bundled or new reimbursement frameworks. But he described Cone’s graduating residents as savvy and beginning to consider practice attributes like overall quality focus, community service initiatives, and overall practice makeup as important factors. “More of our graduates are joining larger practices than seeking independent employment. Moving forward, as more partnerships with health systems and physicians form, the differences between these two arrangements will be less important than in the past, and our physicians will be ready,’ noted Hensel. Cone experienced another strong MATCH this year, securing new interns from Wake Forest, Virginia College of Osteopathic Medicine, University of Virginia and Howard University. In addition to their traditional training curriculum, each resident can also take advantage of several enhanced curricular options. These include Sports Medicine, Obstetrics, International Health and Academic/Teaching and offer the opportunity to augment their learning. with a comprehensive array of insurance products. A.M. Best has awarded Medical Mutual’s professional liability coverage the highest rating of “A” (Excellent) for four consecutive years. Leaders of the NCAFP Resident Section have been busy over the last several months. Their efforts have focused on formalizing two new participation roles designed to enhance communications between and among resident members of the Academy. The efforts originated through discussions by the Section at the 2010 Winter Meeting and work began in January. The NCAFP Board of Directors approved the expansions at its board meeting in mid-April. Resident leaders have created two new participation roles, each designed to improve communication and coordination among residents. The positions include the addition of one (1) resident from each of the state’s (twelve university- and community-based) training programs to serve as a liaison between the Section and each residency program. The Section will also name one (1) resident to serve in a representative role on each NCAFP council: Advocacy, CME, Practice Enhancement, and Health of the Public. Both expansions are expected to improve resident dialogue with the Academy leadership, among fellow residents and their individual programs, and encourage Chapter involvement. The Section will be naming resident physicians to these roles at its annual Resident Section Meeting scheduled for Saturday, December 3, 2011, in Asheville. If you would like additional information on either of these roles, please contact Peter Graber at the NCAFP at (919) 833-2110, ext. 115. NC Residents Enhance Peer Networking with Social Media The NCAFP Resident Section launched a presence on Facebook, the popular social networking site. All NCAFP resident members are being encouraged to join the Section’s group page. To locate it, search ‘NC Family Medicine Residents’ while logged-in on Facebook. Moving forward, the page will provide an additional way for residents to keep abreast of Chapter and Section activities, interact and share information. Dr. Richard Roberts, President of WONCA, the World Organization of Family Doctors, visited UNC-Chapel Hill on May 1-2, 2011. Dr. Roberts’ visit was organized by UNC Family Medicine Interest Group student leaders and was made possible by the NCAFP’s Family Medicine Interest and Scholars program. During his visit, Dr. Roberts met with a number of UNC students, UNC Family Medicine residents and program faculty. He also delivered a presentation to over 50 students and faculty during an FMIG luncheon. Dr. Roberts is currently serving a 3-year term as WONCA president. He is Past President of AAFP (2001), and the Wisconsin Medical Society. For a video recap of his visit - including a short interview - see www.ncafp.com/roberts2011. Let Tangible Solutions connect you to a complete EMR solution. When it comes to integrated EHR/EMR and practice management software solutions, e-MDs is the standard. But did you know that with Tangible Solutions on your team, the e-MDs system can do much, much more? We offer you expanded options and features that keep your practice in the loop — completely and affordably. We work hand-in-hand with you to give you the features, functions, performance, and integration with other products and services that make your practice work more smoothly and profitably. Tangible Solutions is committed to being your long-term partner, offering years of experience, expertise and response that busy practices require. Stop worrying about data. Start connecting effectively with your staff and patients. Give Tangible Solutions a call today. Family Medicine Scholar Patrick Williams with his mentor, Dr. Charles Rhodes. Williams will return to Cabarrus Family Medicine this fall for a clinical rotation. Call MAG Mutualâ&#x20AC;&#x2122;s David Haliburton toll-free at 1-888-892-5218 or visit us at www.magmutual.com. *Dividend effective June 1, 2010. Dividend payments are declared at the discretion of the MAG Mutual Insurance Company Board of Directors. Family Medicine Can Benefit from Business Concepts Surrounding Customer Service By Gregory K. Griggs, MPA, CAE, Executive Vice President I have recently been putting a lot of thought into the impression our members receive when you call, write or otherwise have a request for the Academy. In the association world, we refer to it as member service, but it really is the same as customer service. I want our members to receive the best customer service possible in any interaction with our organization. It’s not always easy, but I know every interaction makes an impression. And you, our members, will remember that impression when you make a decision about renewing your membership or attending one of our meetings. We’re certainly not perfect, but we do try to instill the value of member service in everything we do. Those same simple concepts can also be applied to working with your patients on a day-to-day basis. Regardless of whether we agree with it or not, I believe market forces and “consumerism” are now a day-to-day part of healthcare. Patients are making choices based on whether a clinic has convenient hours or how quickly they can make an appointment. I believe this has – in some ways – led to the rise of retail health clinics, a concept that can give many of us some heartburn. I believe one of the goals of Family Medicine should be to provide the highest quality, physician-led health care possible, but in a more consumer-friendly (i.e., patient-friendly) manner. This is actually one of the key tenets of the patient-centered medical home – providing the right care at the right time, without forcing patients into more expensive care settings such as emergency rooms. PCMH calls for open access scheduling, extended hours, and protocols on how quickly an office responds to various patient requests. Let me give you two examples – one from a retail business and one from health care – that I believe will illustrate my point on the importance of customer service. In the 1990s and early 2000s, I knew of a very good local furniture store that provided a high quality product. One problem – they closed during the week at 5:30 p.m. and only stayed open from 8:30 a.m. to Noon on Saturday. Many of their customers found it more and more difficult to get to this store during their limited hours of operation. Sadly, that furniture store is no longer in business. They simply did not meet the changing needs of their customers. Now, I know many of you are saying that health care is very different. And you are right. But both health care consumers and their employers (who provide the insurance policy that pays the health care bills) are demanding a different kind of primary care and holding physicians accountable to quality metrics and cost savings. I recently heard of a patient experience that made the individual question where they are now receiving care. The individual walked into their primary care physician’s office around Noon with what they felt was a reaction to an insect bite. They didn’t have an appointment and were informed that no appointments were available that day. They ended up having to seek care at a much more expensive alternative: a nearby emergency room. The physicians in the office were ultimately very upset over what had happened. They never knew the patient had even been there. And they are working to change their staff training to make sure a similar event doesn’t happen again. Fortunately, the clinical outcome was fine, but it did make the patient question where they receive their primary care. Have we truly instilled a patient-service culture in the offices of Family Medicine practices? Are we making patients feel like this really is their medical HOME? If a patient doesn’t feel like they can even get a timely appointment, should we really expect them to do better on their own to adhere to the clinical recommendations their family physician makes when they do arrive? Again, none of this is easy. It’s not easy in our offices at a membership-based association, and there are nowhere near the complications here that you face each day as a family physician. Yet, I believe all of us can learn from the basic business tenets of customer service. Whether we like it or not, retail clinics have popped up to fill a void – somewhat due to convenient hours, but it also appealed to a group of consumers who weren’t getting health care in other locations. I want family physicians to be the first choice for health care today and tomorrow. I want you to be highly valued, well-compensated, keys to the future of health care in this state and country. We can all take the first steps by making sure that excellent customer service (patient- and member-service) is part of our daily lives. Hickory’s Dr. Albert Osbahr Elected to the AMA Board of Trustees Dr. Albert Osbahr, III, a family physician from Hickory, NC, was elected to the AMA Board of Trustees in late June during its House of Delegates meeting in Chicago. Dr. Osbahr is currently the Medical Director of Occupational Health at Catawba Valley Medical Center in Hickory and also serves as the Corporate Medical Director for Evergreen Packaging. He also finds time to serve as a Physician Reviewer for the Carolinas Center for Medical Excellence, as well as the Haywood County Health Department as a Medical Consultant. Dr. Osbahr received his B.A. and M.D. from UNC-Chapel Hill, and completed his residency training in Family Medicine, as well as an M.S. in Community Medicine, at Marshall University School of Medicine. He went on to complete an Occupational/Preventive Medicine residency at the University of Kentucky. Dr. Osbahr is Board-certified in Family, Occupational and Preventive Medicine. Dr. Osbahr has been active in organized medicine since medical school, with his membership in the AMA and the North Carolina Medical Society reaching back to 1981. His participation in the AMA began as a member of the AMA Medical Student Section Governing Council in 1982 and he also served on the AMA Council on Medical Service as both a student and a resident. Dr. Osbahr began service as a member of North Carolina’s AMA delegation in 1998. He has been elected twice to the AMA Council on Science and Public Health; first in 2004 and then 2008, reaching chairman status in 2010-2011. He also is a Past President of the North Carolina Medical Society (20082009). The NCAFP forwarded a few questions to Dr. Osbahr regarding his service at the AMA and his perspectives on leadership in medicine. Q: Health care and health care delivery continue to change, and as reforms continue to roll-out over the next few years, more change is on the horizon. What do you see as AMA’s key challenges in the next few years in navigating what’s ahead. AO: The AMA’s key challenge is insuring that the legislation which exists now helps and not hurts our patients. Certainly if we work to help our patients and make changes to the health care legislation, we will make it better for all. Q: In speaking with your colleagues from across the nation, what are some of the things you share about North Carolina and its health care system? AO: We have a very unique situation in North Carolina which can be looked to and possibly exported: the Community Care of North Carolina (CCNC) program. Taking a page from North Carolina can help our fellow states in their endeavors to tackle the problems of Medicaid utilization and help bend the cost curve. Even commercial and private insurance programs are looking to N.C. on this issue. Q: Serving on the AMA Board is a tremendous honor. Describe your motivation for contributing and your goals in representing family physicians, occupational physicians, and all physicians from our region. AO: This is a tremendous responsibility to serve physicians across the country. Certainly helping to provide a perspective about medicine in North Carolina is an important aspect of my new role. Q: You have been actively involved in organized medicine since medical school. For younger physicians who desire to get involved, describe what steps they should take in becoming organized medicine leaders like you have. AO: You, too, can get involved in organized medicine from medical school onward in so many different ways and experiences. Young physicians should know that it does matter if they are involved and lead. Do not sit on the sidelines watching others do the work -- get involved. committed to proactive advocacy efforts. These concepts still apply today. In addition to the above honors, Dr. Townsend was also named Citizen of the Year by the Raeford Kiwanis in 1988. Dr. Townsend cared for an estimated 4,000 families in and around Hoke County. At the request of the family, contributions can be made to either the Raeford United Methodist Church (308 N Main St., Raeford, NC 28376), or to the Dr. Bob Townsend Scholarship Endowment at the North Carolina Community Foundation (4601 Six Forks Road, Ste. 524, Raleigh, NC 27609). to the AAFP Board or Congress of Delegates, and hear from some outstanding speakers, including former Surgeon General Dr. David Satcher. Dr. Viviana Martinez-Bianchi of Duke University had a significant role at ALF, and the National Conference for Special Constituencies (NCSC) that is held at the same time. As Chair of the AAFP Commission on Membership and Member Services that oversees the event, Martinez-Bianchi provided introductory remarks before most plenary sessions, including the opening comments for the two conferences. A video summary of the conference and perspectives by Dr. MartinezBianchi is posted at the NCAFP website at http://www.ncafp.com/alf2011. NCAFP’s Dr. Viviana Martinez-Bianchi, Chair of AAFP’s Commission on Membership & Member Services, played a significant role. about it. It is a fancy and sometimes overused term for a very simple concept: comprehensive care coordination. But at the end of the day, what has been shown about the PCMH model in this country is that if increased payment for care coordination is going to occur for primary care, the PCMH model is the most proven method for accomplishing it. Over 1,000 of your colleagues in this state have received National Committee for Quality Assurance (NCQA – the most widely recognized accrediting institution) recognition as a Level I, II or III PCMH. Is it time for you to follow in their footsteps? A key step in the patient-centered transformation journey is becoming recognized as a PCMH. Today’s most widely known PCMH recognition is NCQA’s Patient-Centered Medical Home (PCMH) designation. NCQA’s recognition is targeted at outpatient primary care practices and was designed with significant input from the American Academy of Family Physicians (AAFP) and the nation’s other key primary care associations. PCMH rigorously assesses ‘medical homeness’ by evaluating a practice on six core standards that measure both systematic and documented care processes. North Carolina currently has over 1,000 providers recognized by the program, a number that is near the top for the entire country and growing rapidly. 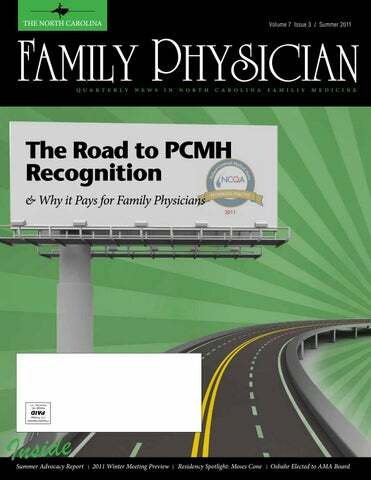 Family Medicine practices that investigate the PCMH recognition program quickly realize that the process is challenging, especially given a practice’s degree of documentation that is required. Plus, the realization that significant time investment will be needed along with organizational and workflow changes make it reasonable for a practice to feel overwhelmed. The good news is that there is compelling evidence that PCMH recognition makes solid business sense, both for the practice and for physicians. Much of this centers on new performance incentive programs being introduced by both public and private payers. Practice leaders can now justify the time and expense needed for recognition and realize real financial benefits in doing so. PCMH recognition can also be framed as a strategic longer term investment that will position a practice to take advantage of the changing health care marketplace, especially as health care reforms role out and major health care purchasers migrate to PCMH standards. In North Carolina, this has already begun to play out. Stability. Success. Satisfaction. What does success mean to you? Is it long, unpredictable hours, or a schedule that allows you to have a healthy work/life balance? Perhaps it’s stability -- affiliating yourself with an industry leader with more than 310 medical centers across 40 states. Even better, success could mean the satisfaction of knowing that the burden of managing a private practice could be eased in an environment where your various insurance coverages and CME credits are paid for. At Concentra, we give you the opportunity to define what success means to you. This can mean as much or as little exposure to the management and administration of our centers as you want. Concentra helps put you on track toward that success, providing continuous opportunities for you to enhance your clinical and professional skills. Concentra is seeking Board Certified/Board Eligible physicians in North Carolina, preferably with urgent care and/or occupational medicine experience, who exemplify the welcoming, respectful, and skillful behaviors that drive our mission of improving America’s health, one patient at a time. Concentra is an equal opportunity employer. To learn more about Concentra, or to apply online, please visit our website. You can also call Amanda Quire, Senior Physician Recruiter, directly at 972-725-6942. Concentra.com/Careers Summer 2011 • The NC Family Physician ©2011 Concentra Operating Corporation. All rights reserved. against the NCQA’s PCMH program standards. TransforMED also offers the ‘TMED Medical Home Vitals Assessment,’ a web-based instant assessment tool, as well as a number of practice-specific consulting services that are fee-based. Regardless of how readiness is determined, pre-assessments will identify key gaps to be addressed and will help the PCMH team construct a reasonable timeline and action plan for the rest of their work. At this stage the real work begins. This process is one that can span from weeks to months. Generally, the time needed is directly related to the level of documentation already in place, the size and scope of a practice, the target level of NCQA recognition, and the amount of resources a practice dedicates. And like the pre-assessment phase described above, numerous resources exist to help practices reach different mileposts on their journey. The PCMH team’s final work product is ultimately the supplied documentation (i.e. documents, screenshots, reports and scans ) that is submitted to NCQA via the program’s web-based survey instrument. This provides evidence of the practice’s established policies, procedures, and care processes. Final applications can consist of hundreds of pages, but quantity does not always translate into quality. There are plenty of examples of lengthy applications being denied, as well as relatively short applications that pass. Emphasis should be placed on a high-quality, succinct yet thorough application. The NCQA PCMH recognition process can be a heavy lift, but it’s extremely worthwhile. To help equip and educate practices on PCMH, the NCAFP’s Practice Enhancement Council and its CME Council are both working to gather the latest information on this process. A number of PCMH-centric learning sessions have already been conducted at NCAFP educational conferences. These have included workshops, lecture sessions and panel discussions. Many of these have centered on nuts-and-bolts implementation techniques that practices are putting to use. Additionally, a growing body of information on PCMH is also available to members at the Chapter’s website. All members are encouraged to take advantage of these. Invest in PCMH. It pays. ‘Undercover,’ continued from p. 19 marketing, they end up spending the wrong proportion of their resources on mediums like print advertising. While advertising can be a useful tool in certain situations, it is a waste of money in others. Whether you are brand new to marketing your practice or have been investing in it for years, it’s never too late to devise a campaign that centers around cost-effective techniques to market smarter not harder – and that begins with good customer service. Start internally by using services such as mystery shopping to identify areas of improvement. After upgrading the patient experience, next strategize a plan for marketing your services to your current patient panel. I realize that may sound strange, but when a patient comes to see you it’s usually for a very specific reason. Because of this, patients may have no idea what ancillary services you offer, such as sports medicine services, minor office surgeries, exercise stress testing or even Saturday hours. It’s still just as important to bring new patients into the practice, but marketing from the inside out ensures you have the infrastructure in place to not only attract new patients, but to keep them long-term. At the end of the day, marketing doesn’t have to cost a small fortune to make an impact. However make no mistake about it, running a medical practice is a business, and at the heart of most successful business models is exceptional customer service. This philosophy, combined with the power of marketing, can result in increased patient satisfaction, increased patient volume, and increased profits for your practice. Amanda Kanaan is a medical marketing consultant and owner of AK Medical Marketing based in Raleigh, NC. Her services include cost-effective marketing techniques for small to mid-sized private practices, including mystery shopping, collateral creation, website design and strategic marketing plans. www.AKmedicalmarketing.com.